If there is one device that delights every game lover, it has to be the Android. Primarily designed as a Linux based operating system for touchscreen devices including the smartphones and tablet computers, its popularity has grown massively. The Android phones double as an excellent gaming avenue for many. With Google Play on board, there has been no looking back for the Android gaming community since its very inception. But certainly not all games are equally good and that brings in the need for charting out the best of the best, top 3 games on Android phones. So let’s get started. 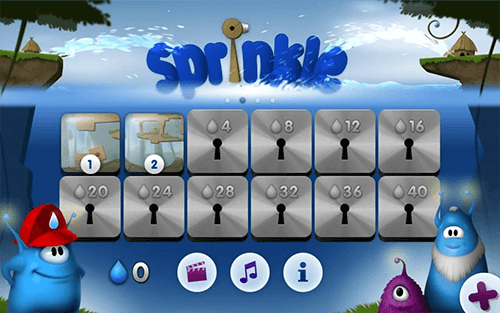 To begin with Sprinkle is an outstanding combination water physics and puzzle. The multiple challenges opened in a single game leave its players gasping for breath. The latest version is available for Android 2.3 and up users. The only weapon for the player is the water cannon which remains mounted on a crane and needs to be adjusted at proper heights and angle for fighting fires, moving obstacles, spinning wheels as well as activating traps. The player has to be really good at squirting since the unrestricted squirting will land you in a waterless position. The lesser water the player uses, the more drops (yes DROPS of water) he earns. With the initial scene of the game seeming as easy as extinguishing fires by squirting water on it, each level of the game gets increasingly challenging with puzzles getting more and more complex and the resources of time and water reducing significantly. The cool graphics and great sounds and animations has lent it a huge fan following. Connectoo is one game that would seem “as simple as that”, but once you start playing you will realize that Connectoo is far from it. Primarily the aim of the game is to connect every two elements of the same color, but hold on, the restrictions to crossing the already drawn line is the thinking part or rather the playing part. The game is again more addictive than one may actually find it to be, since losing lives and time running out keeps the player hooked to play one more game to finish off ‘that level’. People who have had a chance to play this game have commented it to be a game of logic, fast thinking and perception. Another game that must be added to this must-play list is the Muffin Knight. The bright color and scenic background complete with elaborate 2.5D graphics provides a reason enough to play this game; and once you do, you are sure to get addicted. You can play as 18 different characters, each of which has its specific features. The objective is to pass through the attacks of dragons, turtles, werewolves, ghosts, bats, goblins and what not- to ultimately reach the muffins. As the player makes his way up to greater levels, extra abilities are provided. The option of cross platform multiplayer further makes Muffin Knight irresistible, owing to the challenge of defeating a friend in the intense multiplayer match.